When you're working in environments like the security industry, maintaining your sense of touch is integral to your role. As such, any protective gloves you use should be relatively thin to ensure you're able to feel the objects you're in contact with. 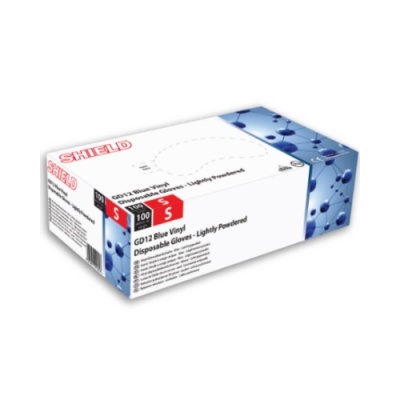 The Shield GD12 Blue Lightly-Powdered Vinyl Disposable Gloves (Pack of 100) help you retain your touch sensitivity, making them ideal for use in a range of different settings. This standard tests to see the extent to which gloves are able to protect skin against chemicals and micro-organisms. Please refer to the table below to view the Shield GD12 Gloves' results. The Lightly-Powdered Disposable Gloves have been evaluated in terms of their suitability for coming into contact with food. According to the test, these gloves are suitable for coming into contact with all food except fatty foods. Available in four sizes, the GD12 Vinyl Gloves allow you to get a more tailored fit. The gloves are also ambidextrous in design so you don't have to worry about pairing the gloves up with one another. To find the correct size, please measure your hand across the widest part of your palm and refer to the sizing table below.